It’s three weeks before the first schedule of the Civil Service Exam (CSE) this year and for those who have successfully applied for the CSE, I’m sure you’re feeling both excited and nervous now. Don’t worry, that’s normal. If you have spent a good amount of time reviewing for the exam in the past few months, you’d feel less nervous and more excited by now. But if you have been setting aside your review sessions, it’s time for you to get more serious now to have better chances of passing the Civil Service Exam. It’s also important that you are aware of a couple of things before the exam including the date and time of your exam (how many days to go before the exam), the exam venue or school assignment (where you are assigned to take the exam), the things to bring to the exam, and some helpful tips so that you can be more confident when taking the exam and hopefully pass the exam. When is the Civil Service Exam happening? For March 18 exam, the application period was from November 16, 2017 to January 31, 2018 only. If you have not submitted your application during this period, you cannot take the exam on March 18. But don’t worry, there’s another schedule of the Civil Service Examination on August 12, 2018. You may file your application from April 18, 2018 to June 22, 2018. The earlier you file, the better, since the acceptance of application is on a first-come, first-served basis. Once the Civil Service Regional/Field Office reached the target number of applicants, they may close the acceptance of applications even before the deadline on June 22. WHERE will the Civil Service Exam be held? The Civil Service Examinations will be held in different training centers nationwide. 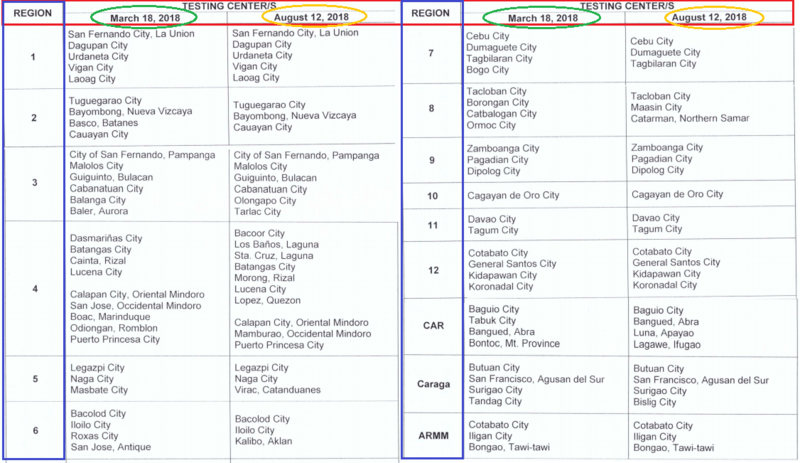 In the National Capital Region (NCR) including Metro Manila, the list of training centers will be announced very soon. We will update this post once it’s announced. In Civil Service Regional Offices, please refer to the following screenshot for the list of CSE Training Centers this 2018. All Civil Service Examinees will be informed of their places of examination through the Online Notice of School Assignment (ONSA). The ONSA will be available at the CSC website approximately two weeks before the schedule of examination. Print out your Notice of School Assignment for your reference. If you cannot access the ONSA or you still don’t know your school assignment one week before the exam, you should verify or inquire directly with the CSC Regional/Field Office concerned. It’s also advisable to visit or have an ocular inspection of your school assignment or the place where you’re going to take the exam so that it would be easier for you to get to the location come exam day. You are advised to bring your Valid ID Card, preferably the same ID that you presented when you filed your application even if is already expired by the time/date of the exam. Your ID must be valid or active and not expired. Otherwise, it will not be accepted. You cannot take the Civil Service Examination without a Valid ID. Water or other preferred beverage (except alcoholic beverage) placed in clear/transparent container. You may also bring candies, biscuits, or fruits, which shall be subject to inspection by the Room Examiner/Proctor. WHAT Subjects or Topics should you review for the CSE? In any exam, it would be extremely helpful if you would take time to review months before the date of the exam. Reviewing will refresh your knowledge on the subjects and will help you gain confidence when taking the exam. You will be less nervous because you are familiar with the subjects. You may not know the actual questions and answers of the Civil Service Exam, but it will become easier to comprehend and answer the questions if you are well-prepared. The number of items for Professional Level is 170 and the time limit is 3 hours and 10 minutes, from 8 AM to 11:10 AM. The number of items for Sub-Professional Level is 165 and the time limit is 2 hours and 40 minutes, from 8 AM to 10:40 AM. What is the Passing Grade of the CSE? To pass the Civil Service Examination (CSE), you must get a general rating of at least 80.00. The list of passers will be posted on the Civil Service Commission website within 60 days after the examination. As soon as you decide to file your application for the Civil Service Exam, train your mindset that you are going to PASS the exam. Prepare for the exam by knowing and reviewing the subjects and topics that are included in the scope of examination (see the list above). Get as much information as possible about the subjects by buying/borrowing books, reviewers, and online resources and articles. Ask additional tips from your family members and friends who have previously taken the Civil Service Exam. You may also join groups on Facebook or in forums who actively share tips about the CSE. Set a schedule for your review sessions so that it becomes a habit and it would be easier for you to review and not to procrastinate. Review as early as possible – months (not days) before the examination day. When you review your resources, do not just memorize. Understand the concept. Memorizing doesn’t necessarily help in answering the actual test questions. If you have reviewers, don’t memorize the answers, but rather, know how it came up with the answer. Know the formula. When reviewing, know what subjects you’re good at and what subjects need more review and attention. Review all subjects but focus on the ones that you are not familiar with so that you won’t have difficulty answering the subjects come exam day. You don’t need to review all day and all night long. Take a break from your review sessions. Have enough sleep. Exercise and eat the right amount of brain-boosting food such as nuts and dark chocolates. On the day of the exam, make sure to bring all the required IDs and documents. Bring water, biscuits and candies or chocolates (if allowed) so that you have something to eat/drink when you get hungry/thirsty while taking the exam. Wear comfortable clothes/shoes. And don’t ever be late. Go to the venue early. Smile, think positive and share the positive vibes to others. Go to the bathroom if you need to few minutes before the exam. Before taking the exam, pray silently and take a few deep breaths to relax yourself. Listen to the Proctor/Instructor and follow the instructions carefully. Make sure to write your Exam Number and your name correctly. Shade the circles corresponding your answers properly. When taking the exam, you may start with the difficult questions first and answer the easier ones later. Or the other way around. Know what works for you and do it. Just remember that there’s a time limit and you need to maximize your time and make sure you answer the questions as efficiently and fast as you can. Do not leave questions blank. If you really don’t know the answer, just choose the best possible answer from the list of choices. That will give you a higher probability of getting a correct answer than leaving it blank. If you finish the exam earlier than the time limit, review your answers and make changes if necessary. Finish the exam with a smile on your face. Be grateful for the opportunity and be ready to accept the result of your exam, whether it’s positive or negative, you still did a great job. If it would help, do not tell anyone that you’re taking the CSE so you won’t be pressured. Or, if you believe you’ll be more motivated and inspired to take the exam if your family and friends know about it, then go ahead and tell them. This way, you can ask for their moral support and prayers. To conclude, here’s my last piece of advice. Believe that YOU CAN and YOU WILL pass the exam. Take action by reviewing consistently. Above all, ask for God’s wisdom and guidance and trust in His plans. Good luck and I pray that you pass the Civil Service Exam!